For long I have been looking for Wallcreepers (Tichodroma muraria). Observations – or even photos – from the Wallcreeper are my dream. I’ve been days hiking in the Alps in the Karwendel mountains, in the Tien Shan in Kyrgyzstan, in the Carpathian Mountains. I was hiking at high altitudes and took a lot of efforts, but up to now I missed these high mountain dwellers. Since I am not alone. The Wallcreeper is actually one of the most sought-after birds in Europe. The Internet although is a help. One problem is that there are many places where Wallcreeper supposedly live. The catch is to find a reliable site. The trip and the spending should be worth it. This is true not only for breeding areas but particularly for wintering grounds. So I was glad to find an article by Dave Gosney from 19th of find March 2008 on “Birding abroad”. 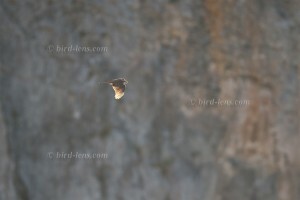 The article is titled: “Finding Wallcreepers in the Sierra de Guara“. The Sierra de Guara is a mountain range south of the famous Ordesa National Park in northern Spain. The peaks reach up to 2000 meters and are divided by rivers, which form a series of deep canyons. This makes the area perfect for Wallcreeper that migrate from the highest peaks of the Pyrenees down to spend the winter on vertical rock walls at lower altitudes. These wintering birds can be seen until early April from early November on. In the Sierra de Guara in Aragon Gosney recommended especially ” El Huevo de Morrano “, the ” Embalse de Calcon ” the Vadiello Dam, the Canyon de Mascun , Rodellar and finally the beautiful , medieval town Alquezar. Ok, that sounds good. I opt for Hotel Villa de Alquezar as my domicile for 3 days. Alquezar is really a medieval postcard city. A real tourist attraction for the Sierra de Guara. I decide to go for 3 subsequent mornings to one of the parking in the town near the Colegiata. In early March there are very few tourists in the town. The weather plays a perfect role. After rain in the weeks before it cleared up on arrival and the next days had great spring weather. The sky is completely cleared up and the sun shines from a steel-blue sky. It is early morning cool though – close to 0 degrees. The limestone walls in the vicinity of the monastery/ church (the Collegiate Church) should be to look carefully for the Wallcreeper, which are not bigger but a Eurasian Nuthatch (Sitta europaea). Particularly attractive seems to me the rocky spur on which the Collegiate Church is built on. The rock is covered on one side with dense ivy, the other ( southern ) side however, is almost bare , only some low herbs secure grip on the steep wall. Both sides attract a lot of birds. It is obvious that migration is already in full swing. The first birds I observe are Chaffinches (Fringilla coelebs). Then there is also the first Song Thrush (Turdus philomelos). They are abundant albeit usually well hidden. Even a single Redwing (Turdus iliacus) is still present. A remarkable number of male Blackcaps (Sylvia atricapilla) are seen. Black Redstarts (Phoenicurus ochruros) must, of course, not be absent in this environment. The limestone cliffs seem to be perfect for the Wallcreepers. Unfortunately, nothing I can see. I walk to one of the well-situated miradores and enjoy the sunrise – point 7:40 am. The sun climbs over the hill and shines on the southern side of the cliff with the Collegiate Church on top. A spectacle! According to the concierge the Wallcreepers are not uncommon around the cliffs in/ near the town. Just 10 days ago one individual has been seen below the cliffs of the Collegiate Church. Even on the facades of townhouses they have already been seen (and photographed). I manage to stay for some time. Unfortunately, I do not see the Wallcreeper . For that I have the opportunity to operate in a challenging photography situation. A male Eurasian Sparrowhawk (Accipiter nisus) shows up in the most beautiful morning backlighting. He obviously picked the surrounding area as a territory and perches for a short time on a branch right on the cliff edge. The Red-billed Choughs (Pyrrhocorax pyrrhocorax) present on the cliffs, do not like this. They attack the hawk and harass him for a while in the air. Of course it is no problem for the gripper to outmaneuver the Red-billed Choughs. Still, it seems to be annoyed. Several time the Sparrowhawk circles in the backlit of the rising sun just before he disappears behind the rocks. After that, the theatre of birds is not over. An observation of a Blue Rock-Thrush (Monticola solitarius) is a highlight. The buzzing song of the Cirl Bunting (Emberiza cirlus) you can hear all the time. But to see the male Bunting is a completely different challenge. Eventually I succeed. What a morning! In order to meet the growing demand for top shots of the rarer species of the Palearctic Bird-Lens is keen to enrich the range of pictures of birds you can find in the western Palearctic. Trips to remote places like this one to capture images of rare birds of western Palearctic were very successful. The nice image of the blog is only a first impression, what you will find in the gallery in the “Picture- Shop” very soon. Just give me a message, if I could serve you with an image needed before the new pictures are online.